When I read the above article, I was immediately reminded of an article I read a few years ago, called “’I know the type of people I work well with’: Student anxiety in multicultural group projects.” The authors of that article identify the “cognitive anxiety” and “affective anxiety” of students doing group work with diverse cultural representation within the group (anxieties that seem to be higher among domestic, rather than international students). Each form of anxiety is attributed to “uncertainty…the phenomenon affecting the way we think about strangers” (Strauss, et al, 816). As a result of these anxieties, English-first language speakers were far more likely to, if given the chance to self-select their groups, invite other English-first speakers and to form more homogenous groups. At times, English-first students actually requested not to be put in groups with EAL students, and believed EAL students to be “novices, incompetents or apprentices” [!!] (819). The authors identify that at the time (2011), “there does not seem to be any consensus as to the best way to structure these [diverse linguistic and cultural] student groups” (817). Returning to the Reid and Garson article, it seems as though they are answering the call and are providing possible strategies for forming functional, multicultural groups. First, I will outline the strengths of the article, but will then highlight some questions and concerns I have. These do not negate the positive aspects of the article, but perhaps will help us dig a little deeper, should we decide to venture into applying Reid’s and Garson’s strategies. As might be expected, the authors note that it is more likely to achieve culturally diverse groups for group work when they are formed, deliberately, by the instructor. Before placing students in groups, a single intercultural lecture (including activities) was delivered before undertaking their group projects. This lecture included “valuing diversity in teams, exploring the role of stereotypes and assumptions in team selection…and understanding the dimensions of cultural frameworks” (200). In part, this may resolve some of the cognitive and affective anxiety experienced by intercultural group members. Another strategy was to have each group member write down what they believed to be the top 6 characteristics of a successful group, and on another paper, their own, personal, 4 strengths they brought to the group (200). This, too, should build confidence and competence working together, as students are able to identify different responsibilities based on identified strengths. This exercise should help mitigate “domestic” students’ preconceptions about the contributions of those from a culture other than their own. In addition to collecting this information about groups’ strengths, the instructor also generated a class list with the students’ “country of origin and gender, to form groups that aligned complimentary skills with cultural and gender diversity”(200). Asking students to self-identify their country of origin risks making cultural generalizations about that student. A student may have been born in Bangladesh and did not leave the country until their university years. Another may have come from Bangladesh when they were 3 months old. “Domestic” students also come from diverse cultural groups. Asking for a student’s country of origin, if they reply “Canada,” will not reveal, for example, Indigenous peoples’ cultural presence. I don’t feel comfortable with the instructor asking the students to identify their gender, as this may be very personal. Asking students to identify their gender may circumvent an instructor’s assumptions about a student’s gender, but still puts the student in a very vulnerable spot. The one-off pre-lecture may actually reinforce cultural stereotypes. From the article, it sounds like there is a heavy focus on cultural dimensions (that is, from the work of Hoefstedde and others in the 70s and 80s, and the general, dichotomized characteristics of cultures around the world). These dimensions can be useful, but must be introduced carefully, as people commonly use these dimensions to “understand” people from cultures other than their own, applying them with a broad stroke and not taking into consideration variances and evolutions in cultures and also individuals. The 2011 article talks about “multicultural groups,” while the 2017 article talks about “intercultural groups,” which are very different concepts. It might be a useful exercise to explore the multicultural and intercultural aspects of these articles, as the distinction between multicultural and intercultural is very significant. This brings me to my last point—the coaching seems to lack an unpacking of one’s own culture, and does not seem to address intersectionality, which is also disconcerting. There is a lot more that can be discussed around this article, beyond what I’ve noted above—by no means is my response exhaustive, but hopefully it opens a channel for reflection and discussion. I regularly use formative feed-back in my class—feedback that is solicited over the course of a term, allowing me to measure student progress, highlighting concepts that are still unclear, and to hear from the students about what is and is not creating an effective learning environment. The formative feedback tool below is new to me, and will be very helpful in determining if and how the difficult topics are addressed in class were ultimately beneficial, or that they require follow-up. At the end of the day (or week, or unit, or other appropriate time period), set aside 10 minutes for the class to respond, in writing, to a few specific questions. (This may be especially helpful to do when a class session has been particularly difficult or tense). What action that anyone in the room took did you find most affirming or helpful? What action that anyone in the room took did you find most puzzling or confusing? If properly prepared, you will actually find that the difficult topics and discussions allow a class to dig deeply into an issue, example, or situation that can take us beyond classroom readings and into ‘real world’ contexts, making learning even more meaningful, relevant, and transformative. At the University of Saskatchewan, we have a growing number of Indigenous staff, students, and faculty. Yet the U of S is comprised of a predominantly white settler Canadian campus population, and is set within a traditional Western institution. As we build capacity and become strengthened by the work and contributions of Indigenous staff, students, and faculty, the non-Indigenous people on campus have a large task ahead of them. The time is “now,” and the “who,” regarding decolonization, is made up of “us” (a majority of non-Indigenous peoples) who, mostly unknowingly, contribute to the systemic racism and oppression felt by the various peoples on campus. Part of the solution to decolonizing the institution is to draw the elements of oppression out of our classes, content, curricula, and institutional systems and policies/documents. What will remain will be generative soil for Indigenous staff, students, and scholars to take root, feel respected and valued for their work and contributions, belonging, and being to thrive. For more information regarding decolonizing and Indigenizing your classes, content, and curricula, and to participate in relevant professional development, contact the Gwenna Moss Centre for Teaching Effectiveness at 306.966.2231, or gmcte@usask.ca. Additionally, we encourage people to consider submitting applications to the Experiential Learning Fund, to help support their efforts to decolonize and Indigenize through practicums, community engaged learning, or field-based instruction. For more information, click here. 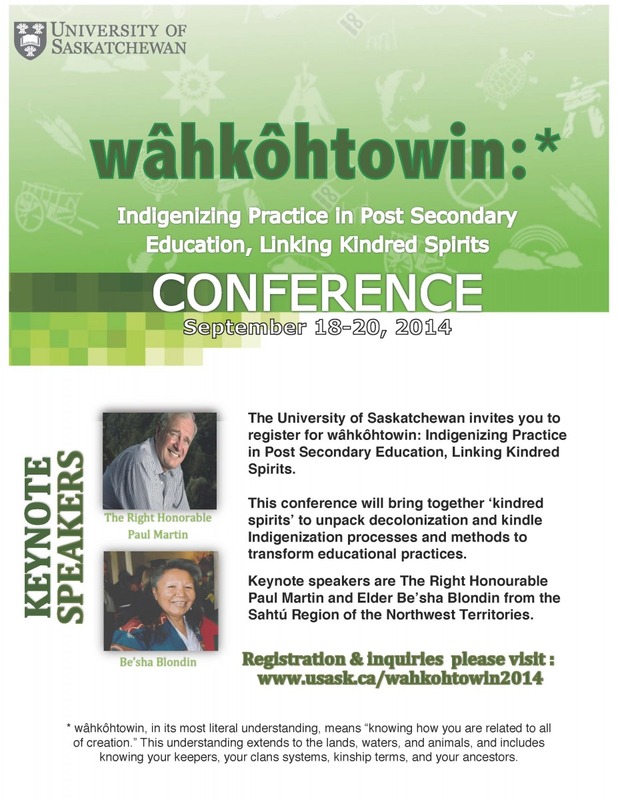 The Beadwork Committee, of the College of Education at the University of Saskatchewan, had a vision for a national conference that would bring together “kindred spirits” to unpack decolonization and kindle Indigenization processes and methods to transform educational practices. This vision is coming to fruition from September 18-20th, when the University will welcome delegates from the province, the country, and the world. 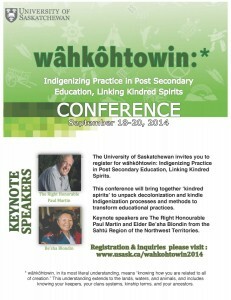 The wâhkôhtowin conference is structured uniquely, in that on the first full day, papers will be presented in concurrent sessions, where delegates might share ideas regarding Indigenous theory and application, decolonizing practices, the value of Story-telling, working with Elders, examining land-based pedagogies, and about ethics, research, and protocols. On the second day, delegates gather at wanuskewin, bringing together their collective experiences and knowledge, and work collaboratively to determine “next steps” toward decolonizing and Indigenizing. “Witnesses” from the four directions will speak at the end of the conference, to reflect on the work that has been accomplished, and the relationships that have been built. The conference could not have proceeded without the voices and prayers of the Elders Mary Lee, Mike Maurice, Darlene Speidel and Martha Peet who are guiding us through the conference. Although the conference is full, the entire campus and community beyond are warmly invited to attend the plenary talk “Indigenous Education: My Journey,”offered by the Right Honourable Paul Martin. We will convene for this talk in Convocation Hall, in the Peter McKinnon Building, on Friday, September 19th, from 10-11:45 a.m. There is no cost for admission to this event. A ground-breaking program, almost unique to post-secondary institutions in Canada, is offered through our own Gwenna Moss Centre for Teaching Effectivness: Indigenous Voices. In its final of three years of PCIP funding, we have been able to develop, pilot, and now deliver campus-wide this staff and faculty program, free of charge. The 14-gathering program was developed in consultation with Elders, Knowledge Keepers, community members, and Indigenous and non-Indigenous faculty and staff, and they continue to introduce learners to a variety of topics that challenge common misconceptions about Indigenous peoples, colonial structures and practices within education (decolonizing), and to Indigenous cultures, ways of knowing, world views, and histories (Indigenizing). Click here to view the program model. Many participants want to begin the program from the beginning, with the “Shared Ground” gathering. In this gathering, terminology, the Indian Act, explanations of “stats,” myths and misconceptions, and participants’ Q & As are answered. Because so many people have requested this gathering, it is now being offered once monthly. The remaining gatherings are held once in each term, so it is not too late to become involved this term! The program is not prescriptive, in that participants need to go through program systematically—rather, through self-assessment, they determine which gatherings are most suitable to them. Perhaps most exciting about the program is that participants are not only describing changes to their professional lives, but even more importantly, to their personal lives. The process of transformation is underway—the impetuous behind the pillar of “Aboriginal Engagement” in IP3. Participants who have invested 20 hours or more in the program are eligible for a certificate of participation, but we have means to document any gatherings attended by any one individual, for his/her records. “Time” is cited as the largest obstacle between whether or not these gatherings are attended. The learnings and profound effects of the program make creating time most valuable and rewarding. You may register for our gatherings on the Indigenous Voices site, or through the calendar of events on the Gwenna Moss site. As a U-15 institution, we have a remarkable opportunity before us: we can be leaders in many ways. I would like to suggest that one of these ways might be by adopting and communicating ‘institutional humility.’ The recent draft of “Vision 2025: From Spirit to Action,” provides us with an excellent opportunity to convey this humility. How do I conceptualize ‘institutional humility’? We acknowledge that our teaching, research, and scholarship can be strengthened by opening ourselves to the different ways of knowing, pedagogies, worldviews, histories, dialogues, and being in relationship to one another. Rather than responding to difference as ‘meeting the needs’ of any cultural group (and by culture, I am not only referring to ‘ethnicity,’ but a plethora of communities). Well-intentioned phrases such as “working with Aboriginal communities to identify their unique post-secondary needs” or “integrating the needs of Aboriginal people into the goals of our institution,” serve only to perpetuate a deficit-philosophy in regard to Aboriginal peoples. The consequences of this perpetuation are to promote a ‘savior’ or ‘benevolence’ role on the part of the institution, and to communicate to Indigenous students, staff, and faculty that they are not here to contribute, but are only a wanting group requiring remedial assistance. A rephrasing might generate a rethinking, such as: ‘work with Aboriginal communities to achieve within the university a unity of spirit and deeper respect for diversity, cultures and traditions, and an inclusiveness and reflection thereof.’ This way of thinking is equally applicable to other cultures and communities. We can come to understand that we can all learn from, better ourselves, and benefit from, what each individual and cultural group brings to the university. In many ways, western/European ways of thinking and doing have built the reputation in which we currently take pride. Imagine how momentous it would be if we raised our collective voices, knowledge, and actions, taking the dominant culture from the forefront of our institutional identity, and moving it alongside those outside of the dominant culture. To adopt ‘institutional humility’ means to change the way we carry out our daily activities as students, scholars, teachers, and staff. Rather than ‘helping’ people ‘fit in’ to the institution, by creating or limiting “special programs for Aboriginal learners or employees,” based on their “challenges,” we ought to make way for all our voices and activities—and become better for it. To communicate humility means to ensure that our institutional, and individual language reflects not a ‘hand-up’ philosophy, but rather a collaborative philosophy. We raise a collective voice, not employing ‘us’ and ‘them’ language. When the institution promotes ways of thinking and doing as separate from the ways of thinking and doing by non-dominant groups, and single out certain peoples as requiring “our” assistance, the ‘us’ and ‘them’ mentality is reinforced. Language is powerful. It conveys to others our beliefs, but it also shapes how we see and live in our world. If our language conveys that some are inferior to others, that will shape how we think and what we do. But language can also convey humility, which makes us more open people in all that we do, and changes the way we act, the way we treat one another, the rigour of our scholarship, and the richness and depth of the education we provide. Humility will build bridges, bring us the forward-looking goals of working on the “world’s most vexing problems,” to establishing “partnerships,” “improving our learning and discovery standards,” “becom[ing] a world-leading authority on globally significant issues,” and achieving “equity in learning and discovery opportunities.” When we look to 2025, we want to demonstrate our commitment to being willing to revision our identity. What’s in a name? For all of us, I would argue, our name is deeply connected to our very identities. There are often stories around how we came to have the name we do, perhaps we’ve been named after a beloved family member, friend, or important person, perhaps it’s a name we’ve chosen for ourselves (but sometimes, a name that has been foisted upon us, as in the case of many First Nations peoples when dealing with the newcomers). Personally, with a train-wreck of a spelling for my name, I hear my name mispronounced all the time (it’s pronounced “terra”). When I first meet someone, it is only slightly uncomfortable to correct the pronunciation, but after several encounters, a persistent mispronunciation can be embarrassing to correct. I keep this in mind every time I start a new class in a new term. Some of my students have names that were previously unfamiliar to me, and it is very important to me to learn to pronounce my students’ names correctly, in addition to simply learning their names. Due to shyness, or cultural norms, a student may feel reticent about correcting your pronunciation, despite warm encouragement to do so. For this reason, on the first day of class, and with permission and promises not to post anything on youtube, I walk around with my iPad and ask the students to hold up cards/papers with their names boldy written on them, and to state their names. The benefits? I learn students’ names more quickly, I associate the written and oral versions of the name (and thus even learn about how different letters make different sounds in languages other than those with which I am familiar), I learn to pronounce the students’ names properly (or to the very best of my ability), and I communicate to the students respect for them as individuals. This little strategy has had a significant impact on my classroom, and I’ve found that fewer international students have felt the need to offer an “English” name because I horrifically mispronounce their given names (although some students prefer to adopt an “English” name). You may also find the site “Pronounce It Right” useful. In the fall, the office of the VP Teaching and Learning began offering treaty education to faculty and staff at the University of Saskatchewan. Each month, a cohort of people engaged in an online module, and then their learning culminated in a three-hour face-to-face session with a Traditional Knowledge Keeper who further illuminated treaty history and issues, and who also provided some critical cultural context. Gordon Barnhart, in his 2007 speech to the throne, made treaty education mandatory in the K-12 school system, so our upcoming generation has some knowledge of treaty history and issues. But for most of the rest of us, we have had little exposure to treaty education, and have a huge gap in our knowledge of First Nations peoples. The development of the treaty module took over a year, and many people were consulted with, including Elders and people from the Office of the Treaty Commissioner. The first question asked in every face-to-face session is, “Why do you think the university has invested in teaching faculty and staff about treaties?” The answers are fairly consistent: it is in accordance with the goal of “Aboriginal Engagement” in the third integrated plan, many people have never learned about treaties, there is a growing demographic of First Nations people, and non-First Nations need to become better informed in order to create a more hospitable campus environment for Aboriginal students. But for me, who has collaborated on the development and delivery of these modules, there are issues that are even more important, and these are what motivate me to learn and share what I know (so far). I will use two Cree words to describe these important principles, from the book Treaty Elders of Saskatchewan, with the hopes that I am not using the words improperly. The first principle that has resonated for me, is that of kihci-asotamâtowin, which means “sacred promises to one another, the treaty sovereigns sacred undertakings”(25). A common misunderstanding amongst people is that the treaties were mere land transactions, undertaken and finalized over 100 years ago. But when the new comers entered into treaties, they entered into a covenant with First Nations people, which was made sacred by the smoking of the pipe. In doing so, it was understood that both parties were making an agreement, not only with one another, but also with the Creator. Thus, the covenant was an enduring one, which could only be broken by the Creator (Treaty Elders of Saskatchewan, 25). The treaties were to last as long as “the sun shines, the grass grows, and the rivers flow.” So today, we—everyone—are responsible for honouring the treaties, not only as they were written, but also as they were orally negotiated. While treaty education is a means to compensate for a western education that erased or misrepresented First Nations people, it is crucial that we learn how to create a more welcoming environment for Aboriginal students. On a larger scale, we have an obligation to both take on the rights and responsibilities of the treaties, and to make steps toward repairing the relations between Aboriginal and non-Aboriginal peoples. Cardinal, H., and Walter Hildebrandt. (2000). Treaty Elders of Saskatchewan. U of Calgary P: Calgary.